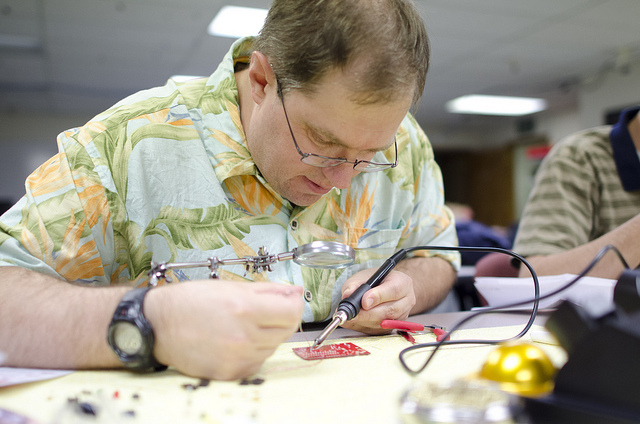 The ability to solder is important to an electrical engineer; however, it is not explicitly taught in the coursework of electrical engineering students. It can’t be that all electrical engineering students enter the workforce without knowing how to properly solder, although I understand that some do. So where do they learn it? In my case, I read tutorials, watched videos, and destroyed circuit boards until I finally mastered the skill but because soldering is something that I learned to do on my own, I have no documentation to support my claim that I can solder. Digital badges provide a way to demonstrate that a person has participated in some noteworthy activity or their achievement of some degree of knowledge. In a way, badges supplement a persons’ official academic records by documenting the granular achievements that are ancillary to a formal education. Workshops, special lectures, museum visits, training sessions, and online courses in many cases all lack a way to document their completion. Digital badges offer a solution to tracking these informal contributions to a persons’ education. Mozilla and the MacArthur Foundation are the two largest forces driving the digital badge movement. Mozilla’s Open Badge Backpack is an account that can be used to store and display earned badges. Mozilla is also host to a project called BadgeKit that provides those who wish to issue digital badges a platform from which to do so. BadgeKit was launched in private beta form in march of this year and are currently requires those who wish to use it to request access to its features. Issuing digital badges has several technical requirement including a server that is capable of hosting general web content such as webpages and images. It also requires the server to be able to make a POST request from its backend and read a JOSN response. Those issuing badges must also be able to automatically email earners. Issuers must be able to maintain a server that continues to host badge information in order to verify badge information. If this seems like a lot to consider, take a look at Mozilla’s BadgeKit project that aims to alleviate most of this burden. Full documentation on badge issuing, earning, and displaying can be found on Mozilla’s OpenBadges website. This blog post was prompted during a discussion about the Galileo’s World exhibition that is to open in August of 2015 at the University of Oklahoma. Galileo’s World is project of the OU History of Science Collection that hopes to involve not just the university, but the greater community in a discussion about Galileo, the history of science and its cultural significance. K12 teachers will be an integral part of the planning and execution of Galileo’s World and will hopefully involves their students as well. Little has been said about how the Children’s Online Privacy and Protection Act applies to digital badges, but it is something that ought to be addressed by those thinking about issuing badges. This blog post about The Chiciago Summer of Learning might be a good place to start for those thinking about these concerns.